Scientists feel they need to better understand the mysterious way in which marijuana works in human bodies. Ever wonder what marijuana does to your brain after you ingest it? A wild new photos shows just what’s going on once people who are high start to feel the effects, providing scientists with the clearest picture yet of how the process works. 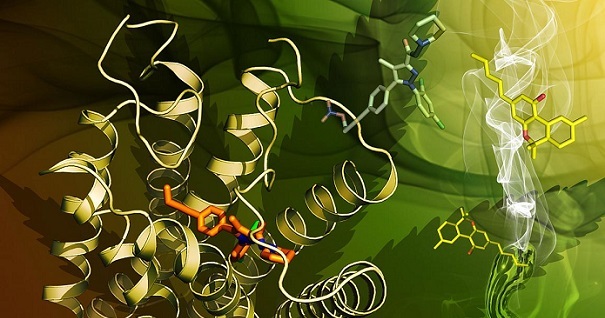 This new, detailed 3D image is part of a study published recently that shows how molecules like THC, the main active ingreident in marijuana, binds to a nerve cell’s receptor, which may help researchers understand why certain medications that mimic the properties of marijuana without the high effect could cause side effects. Scientists feel they need to better understand the mysterious way in which marijuana works in human bodies. The drug can be beneficial medically, but it contains compounds that in certain circumstances could be dangerous. If scientists can figure out how it works on the receptor, scientists could get the medical benefits without the side effects. “With marijuana becoming more popular with legislation in the United States, we need to understand how molecules like THC (the psychoactive component of marijuana) and the synthetic cannabinoids interact with the receptor, especially since we’re starting to see people show up in emergency rooms when they use synthetic cannabinoids,” says co-author Raymond Stevens, Professor at the iHuman Institute, ShanghaiTech University and Provost Professor of Biological Science and Chemistry at the University of Southern California, in a statement.